YOU ARE HERE: Home » What makes a building a Skyline? We’ve done the maths, and a building made with an extra strong frame is stronger than a building made with a strong frame. That’s why our wall studs are never more than 600mm apart. Our roof trusses are also never further than 1200mm apart, and purlins no further than 450mm apart. The closer proximity provides additional support to the entire structure, as well as creating more options for lining walls and ceilings. A wood so strong, they needed three words just to name it. Laminated Veneer Lumber (LVL) is a high quality wood-composite product that’s stiffer, straighter and stronger than sawn timber. In fact it’s so strong, it’s often used as an alternative to structural steel or reinforced concrete, and is more secure than traditional timber in the event of an earthquake. We’re proudly the only company in New Zealand building garages with LVL. Garage, workshop or mission control - whatever you call your Skyline, it’s the cladding that’s responsible for making sure it’s protected from the weather. That’s why our buildings are never clad with less than 0.40mm high quality steel. It’s strong, durable, and extends the life of the whole structure. We’re one of the few companies that use steel of this thickness, and have a range of profiles to suit any build. With over 55 years of building experience, we know New Zealand’s weather pretty well - and all that rain has to go somewhere. A good gutter system is vital to extending your building’s lifespan because it directs rainwater away from the foundation of the building. If water enters at or below the foundation it can cause major problems. 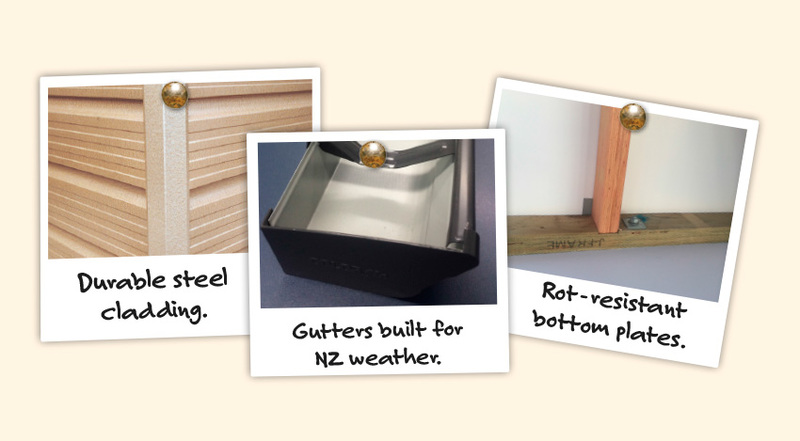 Skyline gutters are made of heavy gauge steel (.55mm thick), and are purpose built to take a large flow of rain for longer - perfectly suited for the New Zealand environment. They’re designed to look good too. While it’s your garage’s job to protect you and your possessions from the elements, sometimes it’s inevitable that you bring the elements inside. This is why our tanalised bottom plates, which anchor the framing of your garage to its foundations, are made with water resistant H3.2 treated timber. So if you’re parking a wet car, bringing in tools from the rain, or frantically containing spillage from a home brewing operation, you’re on safe ground.